The concept of a rugby club in Crowborough began with a letter appearing in the Kent & Sussex Courier early in 1936. Written by Geoffrey Cornford and Roland Hill it informed readers of a proposal to establish a club in the district. The response must have been encouraging as CRFC was formed and the first game, played in March 1937, was against Cranbrook RFC. Unfortunately CRFC lost. The first President was Mr Justice Rigby Swift who lived at Kiona on Beacon Road (since demolished and rebuilt as Swift Close, opposite the Blue Anchor Inn). An adjoining field belonging to the judge was lent by him to the new club and was quickly converted into a match ground. The landlord of the Blue Anchor provided clubhouse and changing facilities. Morton E. Barnes (ex-Wasps), later to become the longest serving President, is recorded as refereeing in 1937, and was no doubt a team player from the outset, but from the date of the first AGM, 13 May 1938, he had become club secretary. The new president was now Dr E.F. White. In 1940 the energetic Morton Mickey Barnes became the next president when Dr White retired. Dr White's first year had seen CRFC into membership of the Sussex Rugby Union. 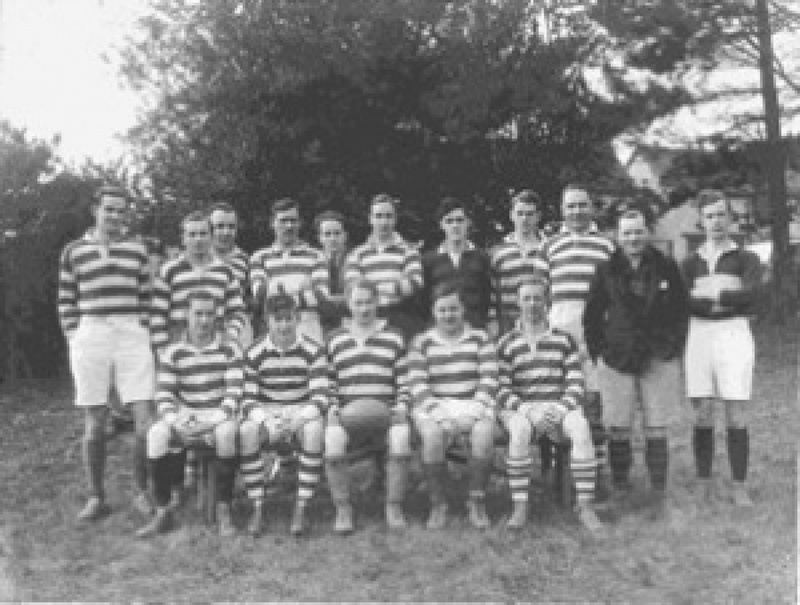 He had also presided over an historical event in the club's history when, on its own ground at Beacon Road in 1938, for the first time CRFC played against one of the oldest club in the country the Wasps. During the Second World War the club became dormant although a few games were played against the army billeted in the town. With the arrival of peace, the undaunted Morton Mickey Barnes revived the club in 1946. His presidency, held in abeyance, was now reactivated and he quickly arranged a first, new season fixture, against his old club, the Wasps, at home on 21 September 1946. This match was played on the old Beacon Road site. A radical change came with the opening of the 1948/9 season. CRFC joined with the ex-members of the old Tunbridge Wells RFC, who were without a ground of their own, to form a new club Crowborough & Tunbridge Wells Rugby Football Club which soon became known popularly as the 'Borough' The club was affiliated to the Sussex RFU. Dr H. Oswald-Smith, a past-president of the Scottish Rugby Union, became the 'Borough's first president. Mickey Barnes was elected chairman. The new club played its first match on 24 September 1948 at its recently rented site at Steel Cross, playing against Old Azurians (Worthing). The Boar's Head Inn was the changing room. For the 1949/50 season, 'Borough' obtained permission to play on the St Mark's Recreation Ground, Frant Road, Tunbridge Wells. The club now had two grounds available to them and the old Monson Road Baths was the changing room facility for this venue, for there was no building on site. CRFC returned to independent status for the 1953/4 season with Mickey Barnes continuing as President. In October 1954 CRFC purchased the freehold of its present ground at Steel Cross, being formally opened by the President of the Rugby Football Union, W.C. Ramsey in 1955. In 1962 the existing clubhouse was built with an estimated life of 20 years! Considerable improvements in drainage of the playing areas, which began in the scorching summer of 1976, have been made and are still continuing. Achievements have been many. For instance, the club initiated the first sports exchange with Crowborough's twin town Montargis in 1966. A satisfactory all round 0-0 draw took place on CRFC's own ground against USM Montargis on 9 April that year. Sadly the annual matches between the two clubs have now lapsed. Other achievements include players being selected for the county side at least seven times, and CRFC has twice won the coveted Sussex Knock-Out Cup in 1973 and 1976. An excellent Youth Coaching Programme successfully encourages participation in the game while developing skill, attitude and character which is something to be proud of. In addition, the club was one of the first clubs in Kent and Sussex to establish a Mini section for the Under 7 to 12s. Over the years the club has embarked on and hosted many overseas tours and in October 1977, the George Washington RFC from the USA paid a memorable visit to Crowborough, where a social match was played at Steel Cross. This visit prompted two successful tours of the USA by CRFC in 1979 and 1981. Rewarding also has been the club's participation in charity works and matches as well as social engagements, including youth and church work. For example, back in 1997 four members completed a mountain triathlon lasting 10 hours over 42 miles on the Isle of Skye to raise funds for the Anthony Nolan Bone Marrow Trust. A major milestone in the development of the game took place in 1987 with the establishment of League Rugby. CRFC found themselves in Sussex 1 and, apart from one season when they were relegated, there they stayed until 2006 when, on winning the league, promotion to London 4 was achieved. Since then the club has gained two further promotions and now plays in London South East 2, finishing 3rd last season. The most obvious recent milestone in our illustrious history was moving into our new clubhouse facility in September 2011. This has allowed us to move to a new level both on and off the field in how we do things and without question has enhanced our reputation as a great rugby club. So, over the last 70 years of club history many players, volunteers and supporters have been involved with the club making it a friendly and welcoming place to be. The belief, by all those involved today, is to continue with this tradition. Many things have changed in our world but the essence of rugby, friendship, sportsmanship and camaraderie are still values we cherish.